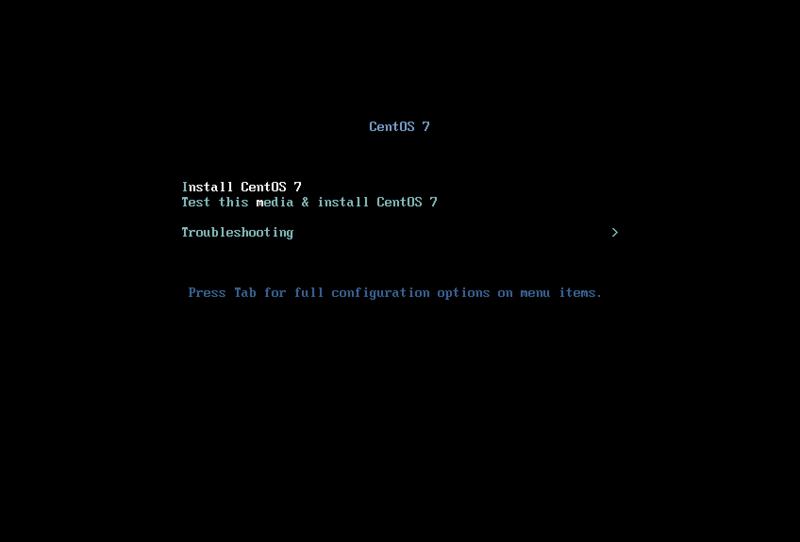 This example shows you how to install a CentOS image and focuses mainly on CentOS 7. 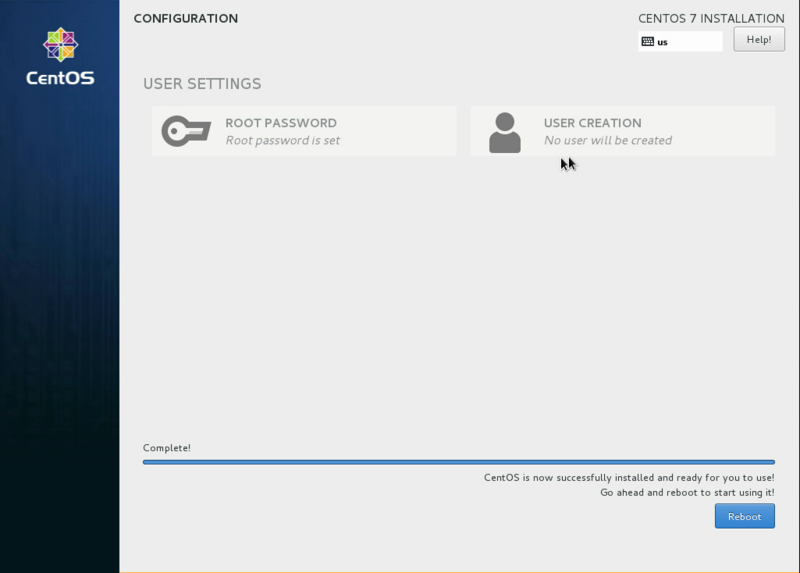 Because the CentOS installation process might differ across versions, the installation steps might differ if you use a different version of CentOS. Navigate to the CentOS mirrors page. Click one of the HTTP links in the right-hand column next to one of the mirrors. Click the folder link of the CentOS version that you want to use. For example, 7/. Click the isos/ folder link. Click the x86_64/ folder link for 64-bit images. Click the netinstall ISO image that you want to download. For example, CentOS-7-x86_64-NetInstall-1611.iso is a good choice because it is a smaller image that downloads missing packages from the Internet during installation. Start the installation process using either the virt-manager or the virt-install command as described previously. If you use the virt-install command, do not forget to connect your VNC client to the virtual machine. The name of your virtual machine image is centos; you need this name when you use virsh commands to manipulate the state of the image. You saved the netinstall ISO image to the /data/isos directory. At the initial Installer boot menu, choose the Install CentOS 7 option. After the installation program starts, choose your preferred language and click Continue to get to the installation summary. Accept the defaults. The default Ethernet setting is OFF. Change the setting of the Ethernet form OFF to ON. In particular, ensure that IPv4 Settings' Method is Automatic (DHCP), which is the default. The installer allows you to choose a host name. The default (localhost.localdomain) is fine. You install the cloud-init package later, which sets the host name on boot when a new instance is provisioned using this image. Depending on the version of CentOS, the net installer requires the user to specify either a URL or the web site and a CentOS directory that corresponds to one of the CentOS mirrors. 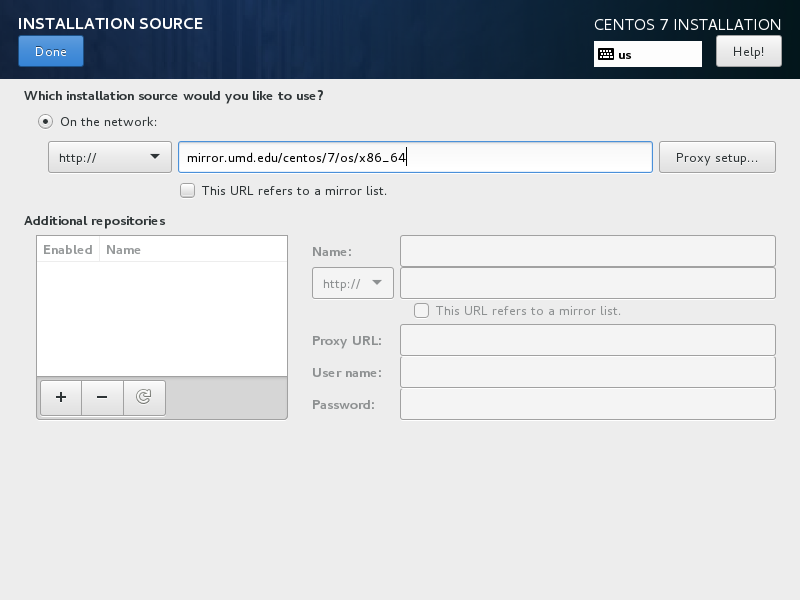 If the installer asks for a single URL, a valid URL might be http://mirror.umd.edu/centos/7/os/x86_64. Consider using other mirrors as an alternative to mirror.umd.edu. See CentOS mirror page to get a full list of mirrors, click on the HTTP link of a mirror to retrieve the web site name of a mirror. If prompted about which type of devices your installation uses, choose Virtio Block Device. There are different options for partitioning the disks. The default installation uses LVM partitions, and creates three partitions (/boot, /, swap), which works fine. Alternatively, you might want to create a single ext4 partition that is mounted to /, which also works fine. If unsure, use the default partition scheme for the installer. While no scheme is inherently better than another, having the partition that you want to dynamically grow at the end of the list will allow it to grow without crossing another partition’s boundary. Step through the installation, using the default options. The simplest thing to do is to choose the Minimal Install install, which installs an SSH server. During the installation, remember to set the root password when prompted. To eject a disk by using the virsh command, libvirt requires that you attach an empty disk at the same target that the CD-ROM was previously attached, which may be hda. You can confirm the appropriate target using the virsh dumpxml vm-image command. Run the following commands from the host to eject the disk and reboot using virsh, as root. If you are using virt-manager, the commands below will work, but you can also use the GUI to detach and reboot it by manually stopping and starting. To enable the hypervisor to reboot or shutdown an instance, you must install and run the acpid service on the guest system. Install a cloud-init RPM, which is a port of the Ubuntu cloud-init package. This is the recommended approach. Modify the /etc/rc.local file to fetch desired information from the metadata service, as described in the next section. The account varies by distribution. 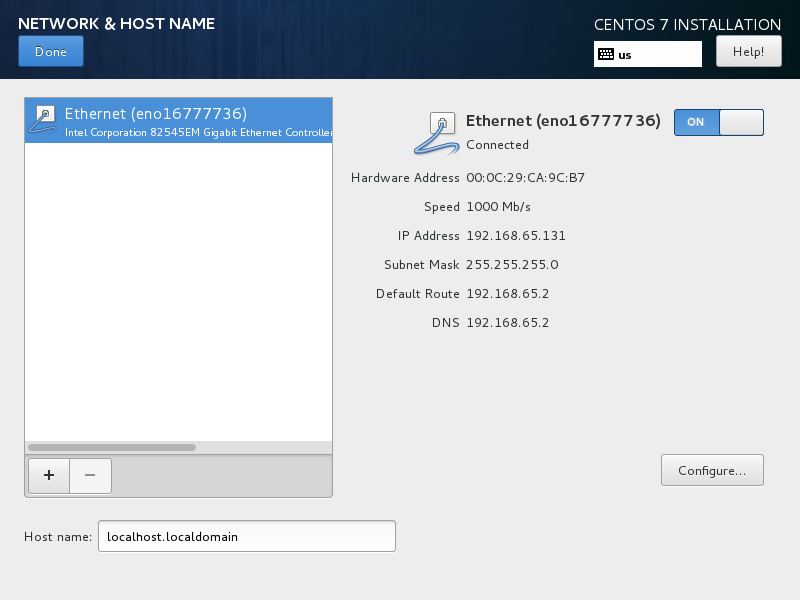 On CentOS-based virtual machines, the account is called centos. In order for the root partition to properly resize, install the cloud-utils-growpart package, which contains the proper tools to allow the disk to resize using cloud-init. Some VNC clients replace the colon (:) with a semicolon (;) and the underscore (_) with a hyphen (-). Make sure to specify http: and not http;. Make sure to specify authorized_keys and not authorized-keys. The previous script only gets the ssh public key from the metadata server. It does not get user data, which is optional data that can be passed by the user when requesting a new instance. User data is often used to run a custom script when an instance boots. As the OpenStack metadata service is compatible with version 2009-04-04 of the Amazon EC2 metadata service, consult the Amazon EC2 documentation on Using Instance Metadata for details on how to get user data. Edit the /etc/default/grub file and configure the GRUB_CMDLINE_LINUX option. Delete the rhgb quiet and add console=tty0 console=ttyS0,115200n8 to the option. The operating system records the MAC address of the virtual Ethernet card in locations such as /etc/sysconfig/network-scripts/ifcfg-eth0 during the instance process. However, each time the image boots up, the virtual Ethernet card will have a different MAC address, so this information must be deleted from the configuration file. The underlying image file that you created with the qemu-img create command is ready to be uploaded. For example, you can upload the /tmp/centos.qcow2 image to the Image service by using the openstack image create command. For more information, see the python-openstackclient command list.